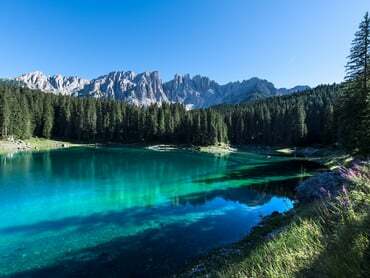 The absolutely most beautiful mountain lake in the Alps is a "must see" for every holidaymaker in South Tyrol. This natural monument lies on the edge of the Latemar Forest at an altitude of 1,520 metres only 3 kilometres from Hotel Moseralm and is famous principally for its deep green, crystal-clear water. 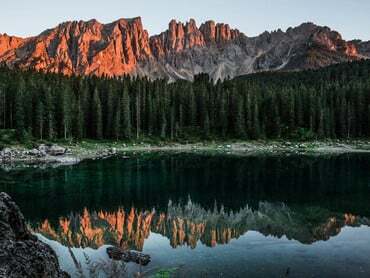 Lake Carezza is at its most beautiful in the morning and the evening, when it offers a really special spectacle. 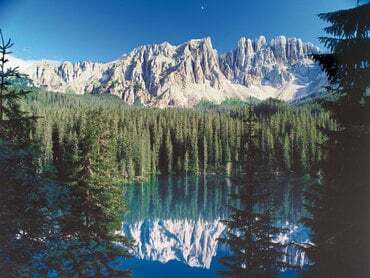 The Dolomite Mountains, Rosengarten and Latemar, which frame the lake, are reflected in the waters. The lake is 300 m long and 140 m wide and is fed by subterranean springs from the Latemar mountain range. The depth of the lake depends greatly on the seasons and the water, at its greatest depth, is estimated to be 22 m. Many South Tyrolean sagas are woven around this lake and many painters, photographers and writers choose it as the inspiration for their pictures and tales.